2014, you wily beast… We’ve laughed, we’ve cried, we’ve partied, and we’ve run the gauntlet. 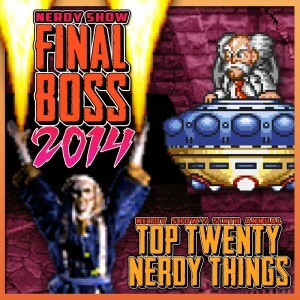 All that’s left is the ultimate challenge – the FINAL BOSS that is Nerdy Show‘s annual “Top 20 Nerdy Things of the Year”. The list that makes all other year-end countdowns cower in shame. What makes our Top 20 so brutal? We subject the year’s pop culture, achievements in science & technology, and world happenings to a test of might that leaves titans shattered: we rank them on nerdiness. No sane person would dare compare a major motion picture against scientific achievement – but, for the betterment of humanity, we do. Join Cap, Brandon, Doug, and Jon as we count down the year’s most niche tributes to all that is good and nerdy in this world. Discover what major cultural zeitgeists from movies, TV, and gaming have held their own and which of their lesser-known counterparts have triumphed unflinching. Here you’ll find the nerdiest comics, the nerdiest albums, and some truly bizarre happenings from this year, so empowered by their unbridled geekiness, that they’re now retired comfortably within the annuls of this hallowed tome.